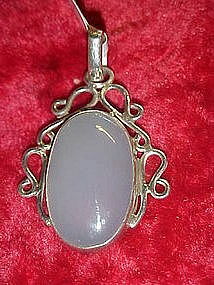 Large lovely pendant with a moonstone set into sterling silver.Pretty opal powder blue stone is so pretty. Stone measures 3/4" x 1 1/4" plus the filigree silver setting and chain slide. This does not come with a chain. Email me if you need to see a picture of the back.